Magento 2 Pre-select Shipping/Payment FREE extension speeds up customer checkout process by pre-selecting the shipping and payment methods. Magento 2 default offers various shipping rates as well as payment methods for buyers to choose on going through the Checkout process. Pre-select Shipping/Payment for Magento 2 extension Free is a must-have tool to make the purchasing process faster by pre-selecting shipping/payment options. Pre-select Shipping/Payment for Magento 2 extension Free supports admins to auto-select a shipping method for customers, as needed. For example, admin easily pre-chooses flat rate shipping in the checkout process for customers. Admins are also able to have a method pre-selected and loaded in the payment method section. Using Free Magento 2 Pre-select Shipping/Payment extension, admins can steer buyers to pick the convenient payment method for the website. 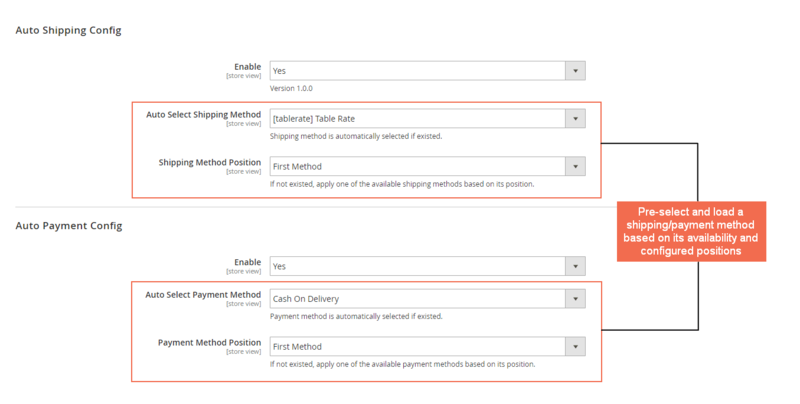 If the methods auto-set in Checkout process are not available, Magento 2 Pre-select Shipping/Payment extension Free will load and display the shipping/payment options based on its ordered position in the backend. Why Is Magento 2 Pre-select Shipping/Payment Extension Your Must-Have Extension? After adding products to cart, customers go through the checkout page. They get hit with various shipping rates and suddenly reconsider the decision to purchase. Selecting shipping method in advance definitely frees buyers from confusing which method to pick, then completing order more quickly. Moreover, if most of your buyers typically use one method of payment, then just pre-fill that option using Free Magento 2 Pre-select Shipping/Payment extension. This setting improves customers’ experience much as they never have to manually choose the payment information again. Your free pre-select shipping/payment are good but quite basic. I asked your support team to include some extra configurations and they've helped it out quickly at reasonable charge. I'll come for more Magento 2 extension. I had looked for Magento 2 Pre-select Shipping/Payment extension for months and fortunately I found your extension. Thanks to easy-to-use configs, I can set a shipping/payment method to be pre-selected on checkout page within minutes.